Troy-based North American Bancard Holdings (NAB), a payment solutions company, and Homebase, a provider of team management solutions, today announced a partnership to offer small businesses an employee management tool. The Homebase software is being offered through NAB’s PayAnywhere technology platform. As part of the new offering, NAB added a time clock feature into its PayAnywhere application, and now, through an integration with Homebase, employees can clock in and out through either the PayAnywhere or Homebase platform. The new offering can turn tablets, smart phones, and a computer browser into a sophisticated time clock. 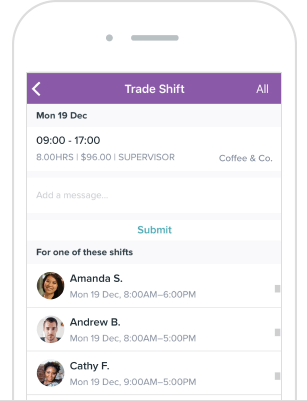 In addition to recording hours worked, the Homebase integration enables business owners to download timesheets for payroll, broadcast team communications, and access employee scheduling capabilities, allowing merchants to manage labor costs in real-time. The time clock integration and basic timesheet management and scheduling capabilities through Homebase are available to all PayAnywhere merchants at no cost. The merchants also have the option to upgrade to more advanced employee management capabilities available from Homebase, such as predictive scheduling, GPS-enabled time clock, more robust time-keeping features, and powerful reporting tools. NAB’s PayAnywhere technology platform also provides merchants access to an array of capabilities to efficiently run their business, including inventory management, in-depth reporting, dispute and chargeback management, account and equipment maintenance, invoice management, and a virtual terminal to accept phone, mail, and online payments. “Homebase is committed to making hourly work easier for every owner, manager, and team member. Our partnership with NAB and our integration with PayAnywhere brings us one step closer to that goal, as we can now help improve the lives of workers across their broad base of customers. We are excited to bring our leading tools for scheduling, time-tracking, communication and hiring to PayAnywhere customers through one integrated and easy-to-use solution,” said John Waldmann, CEO of Homebase. Homebase has more than 100,000 businesses that use its platform. The company, with offices in Houston and San Francisco, is backed by venture investors including Bain Capital Ventures, Baseline Ventures, Cowboy Ventures, and Khosla Ventures. NAB’s PayAnywhere platform helps small-to-medium-sized businesses serve the omni-channel shopping preferences of their customers by connecting easy-to-use solutions that accept all payment types in-store, online, and on the road. Founded in 1992, North American Bancard Holdings operates a secure, international processing platform that provides end-to-end transaction solutions, eliminating the need for multiple vendor relationships by combining the functionality of an ISP, merchant acquirer, gateway, and a front-end and back-end processor. The company is sixth largest non-bank acquirer in North America, and serves 350,000-plus businesses and processes more than $50 billion in electronic payments annually.